Heat oven to 400° F. Grease 12-inch pizza pan. Unroll dough; place in greased pan. Starting at center, press out dough to edges of pan. Bake for 10 to 12 minutes or until crust begins to brown. Meanwhile, in 10-inch skillet, cook ground beef over medium-high heat 5 to 7 minutes, stirring frequently, until thoroughly cooked; drain. Stir in sandwich sauce and corn. Cook until thoroughly heated, stirring occasionally. 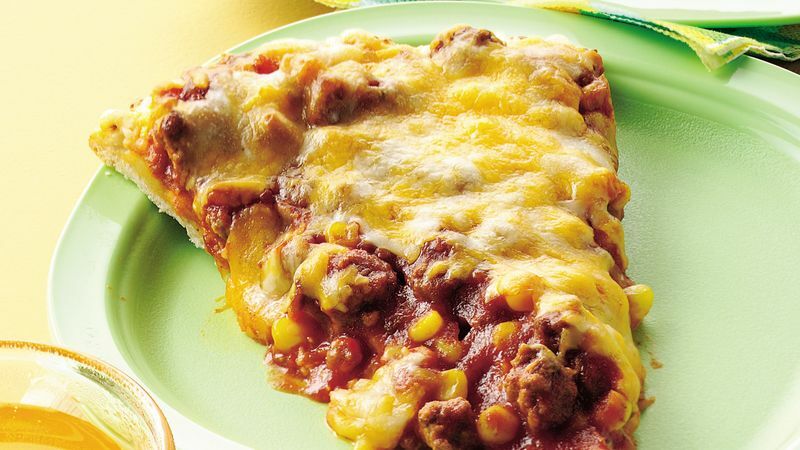 Spoon beef mixture evenly onto crust. Sprinkle with cheese. Bake an additional 10 to 12 minutes or until cheese is melted and crust is golden brown. Serve this family pleasing pizza with fresh veggies and Ranch dip.